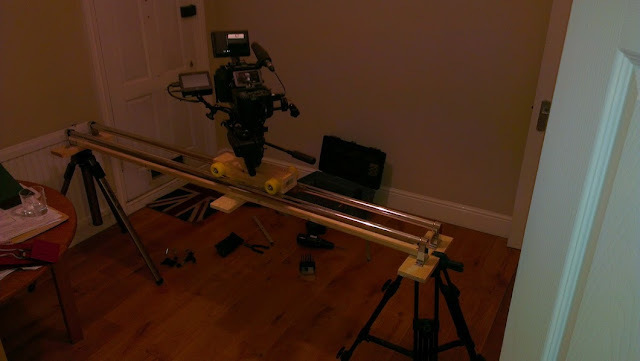 The finished slider working on set and easily carrying my full camera rig. Like a lot of you, i bought a 1m camera slider a couple of years ago. My films suddenly had sideways motion in them! Great.... but, using such a small slider gave me a few problems. I had to dismount my camera from it's rig because the slider couldn't take the weight of my full camera rig. This meant losing time on set.. The 1m slider also seemed really small for a lot of work. Unless there's stuff right in the foreground or you're close to the ground, it's hard to see the dolly movement having much affect on the shot. I decided i needed something bigger. Why not get or build a full-sized 'doorway' dolly you might ask... Well, i've got one of those and it's great for feature film sets...nothing does a 20m tracking shot like a proper dolly.. 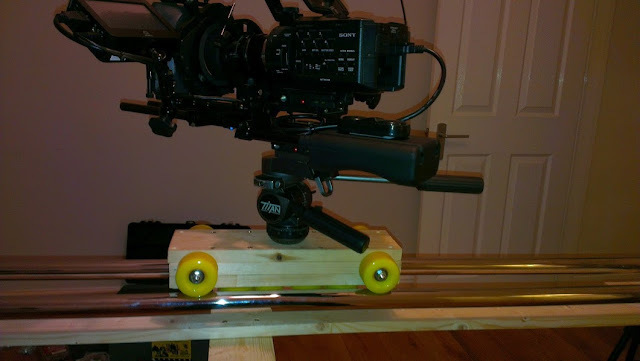 But, you need a van to transport it around and you need someone to push it.... not ideal for small shoots like music videos and to be honest, a lot of feature work requires quick set ups on indie shoots, and the full sized dolly ain't quick to get rigged. 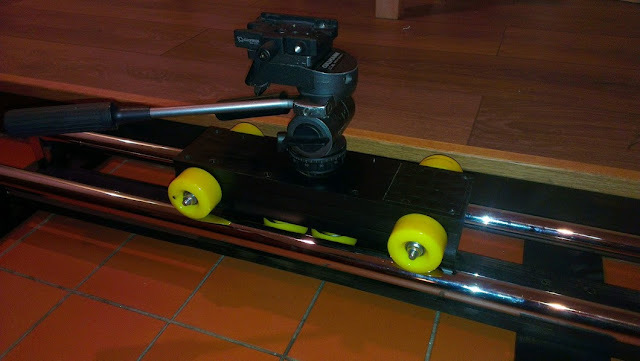 My original idea was to build a 2m slider with a permanent track like a slider, but with a removable dolly that runs on skateboard wheels. The track should be solid enough that i can mount it on a pair of tripods for use at waist or even head height. I also wanted it to be tough.. it had to take the abuse that doing lots of set-ups in a day can dish out to equipment. My first step was to make the dolly itself. I bought 8 old skool skate wheels from eBay. 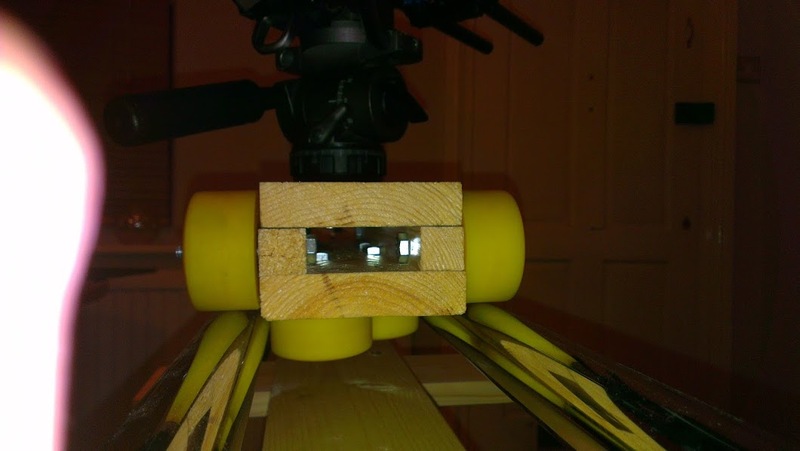 They had to be old as modern ones often have recessed bearings and i need to mount the wheels almost flush to the dolly. Older wheels are also usually made of softer rubber than today's skate wheels. I got 8 wheels for about a tenner. Result. Then i bought some aluminium box section and some wood. 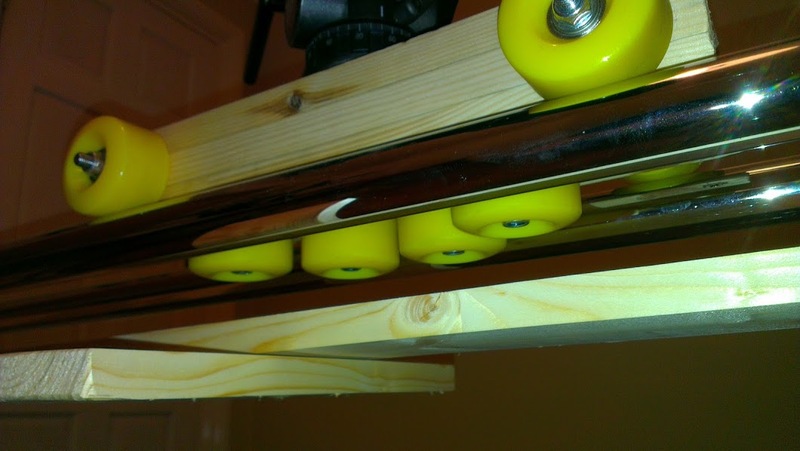 I cut the box section and drilled holes for the bolts which were going to hold the main wheels... then i drilled the piece of wood which was to become the bottom of the dolly to hold the other 4 wheels in a 2 + 2 offset arrangement. After messing around with various designs based on what i'd seen online, i decided against the 45 degree angle wheel mounting like a lot of DIY dollys use... it just seemed a bit unstable and made the dolly sit to high on the track. Version 1 of the dolly..(upside down here) Ally centre and wood top & bottom. Slightly rough build quality for the 'test' version. After a bit of testing on the knocked-up version of the track, it became clear than the bolts holding on the main wheels where not working too well with the aluminium.... it also had a nasty 'hollow' sound as it moved. But... it worked really well. I decided to replace the side sections with wood and start again. See the wheels on the underside...they keep the dolly on the track. Testing with the Cullman Titan Fluid Head attached with 3 big bolts. More testing. The rails are 1.8m heavy duty chrome curtain poles. Once the dolly was working well, i made the track more permanent. It's just two 1.8m heavy duty curtain rails. These are ideal is they are strong, light and come with end sections which hold the poles in place. I lined the insides of the pole holders with rubber to make the join more solid. Then it was just a case of joining the two sections together with a simple piece of wood.... finally i added rubber feet to all three floor pads. The end sections can also be mounted on tripods. Finally, it just need a paint job. Luckily for me, this whole thing fits in my car so i can get around to shoots without renting a van. On the first two shoots i used it on, it was perfect... i'm so happy with it...and it cost about £80 all in! That is awesome. I was thinking of something like this too but i was stuck on what to use for the rails. PVC is not the answer. This is! Well done.